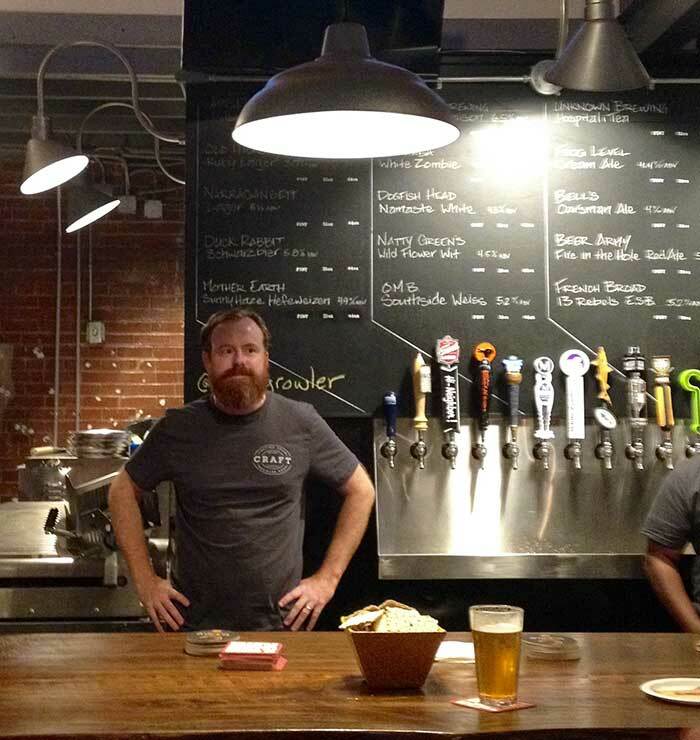 Craft Tasting Room and Growler Shop opened their doors on South Church Street a year ago. The first time I walked in, I was greeted with 36 different beer choices and a larger than life cheese plate. I immediately knew I was in love. 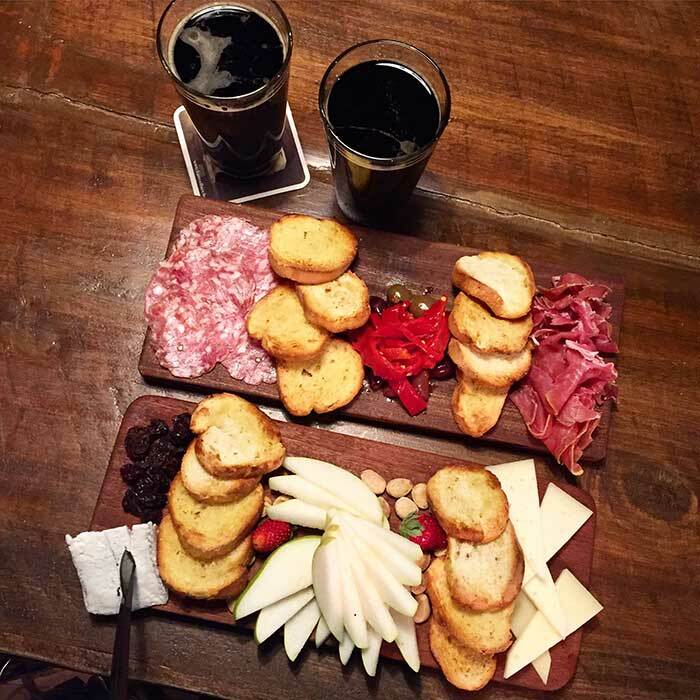 Over the past 12 months, I have found any and all reasons, ranging from the cozy atmosphere and excellent patio to free boiled peanuts, to spend my evenings on one of Craft’s barstools, tucked into a cheese and charcuterie plate (one of each, please!) and a flight of their rotating brews. The space is cozy in just the right way. Craft has a certain rustic charm; with exposed brick, a large wooden bar and friendly bartenders, Craft’s open, inviting space is the perfect place for beer lovers to congregate and converse. Fun fact: Craft’s space was a vintage toy store, which I can only imagine was full of creepy dolls. A small, neighborhood bar is definitely more my scene. Craft is never too crowded; the amount of people is just right. Every time we go to Craft, there’s always room to slide onto a bar stool, grab a table in the corner, or squeeze into a picnic table on the patio. Even on its busiest nights, I can still hear my friends over the din of other beer drinkers (it appears as I get older I get more and more like my grandfather every day, and cannot handle myself in loud bars). The few nights we’ve been to Craft when it’s standing room only, I feel like my personal space is still respected (very important to me in a bar I’m going to frequent on a Saturday night). I’ve never had to elbow my way past a bunch of 25-year-olds in fleece vests to get to the bar. It’s a great place to catch a Panthers game. The size of Craft’s usual crowd, its proximity to Bank of America Stadium, four TVs and 36 choices of beer make it an ideal spot to watch Panthers’ home games. Go tailgate on Mint Street pre-game — it’s the perfect combo. Craft’s focus is on craft beer. 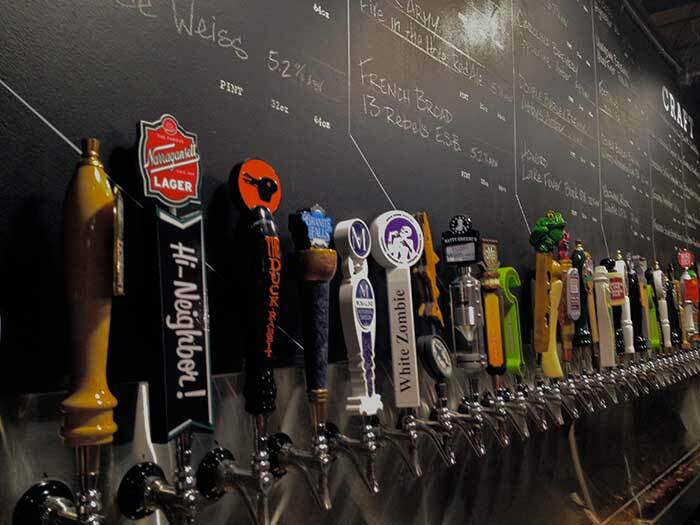 Craft has an impressive craft beer selection — of the 36 taps, half are dedicated to local breweries and the other half are dedicated to regional brews and special edition beers. Beer lovers can try the beer by the pint or by the flight. If drinking at home is more your thing, grab a six pack or bomber bottle from Craft’s grocery section or fill up a 32 or 64 ounce growler to bring home. 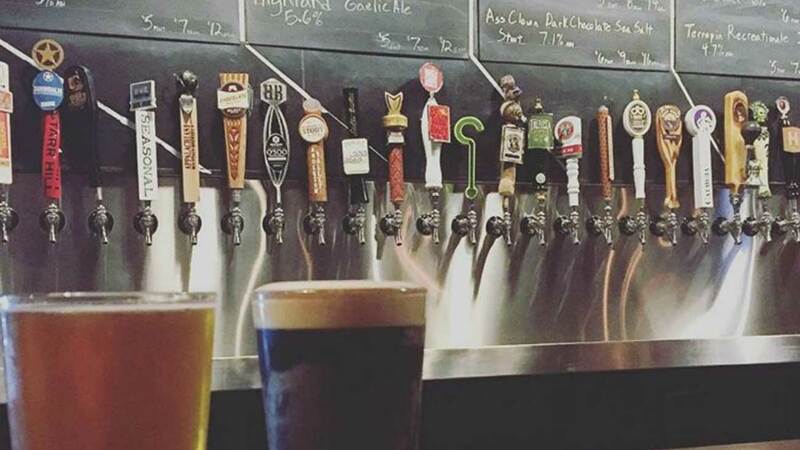 Tip: Craft’s taps are ever rotating, and they are pouring something new every few days or so. Follow them on Twitter where they announce what’s on tap. A flight is definitely the way to go. Choosing just one of 36 beers is a little bit of a Sophie’s Choice, so I usually opt for a flight so I can sip on five different brews. 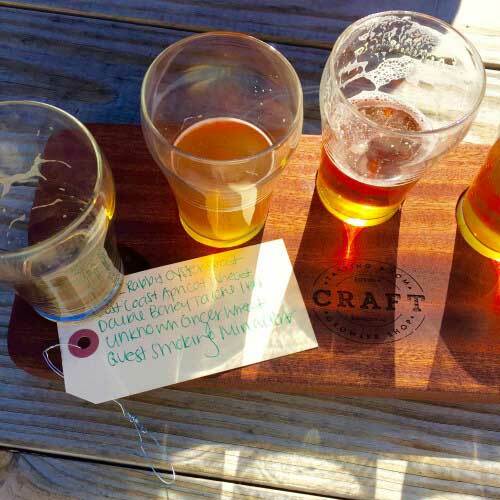 As a bonus, Craft’s flight trays double as their meat and cheese boards. They just flip them over depending on what they’re using them for. Ingenious. Craft has an impressive selection of sundries and sells the best mustard. Spend some time perusing Craft’s impressive selection of beer, wine, sauces, snacks and other sundries on their grocery shelves. Many of the beverages and products are local or hard to get anywhere else in Charlotte. One night we were at the bar enjoying some pints and snacks, and a gentleman who had been imbibing too much demolished an entire jar of mustard by himself. He put some on the pounds of cheese he ordered and then gave us some cheese and mustard and I totally understood why he ate the whole jar. It was really freaking good mustard. They’ll give you free boiled peanuts. 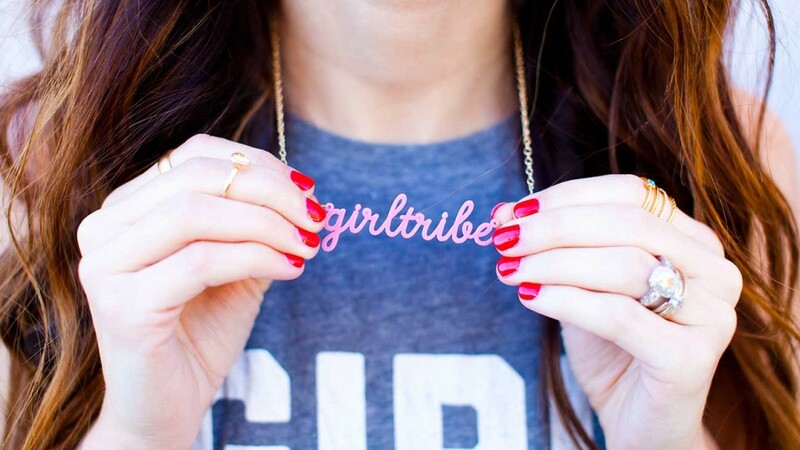 Free things are great, and these peanuts are no exception. They’ve got a kick, too. Craft has a simple, but delicious, menu. Craft’s menu boasts a selection of cheeses, charcuterie, salads and pizza. Cheese and charcuterie plates come with honey, preserves, nuts, fruit, bread and olives. The cheese and charcuterie boards are not only pretty to look at, but are some of the best meat and cheese boards I’ve have in Charlotte. The pizzas and salads, while simple, are creative, flavorful and tasty. They serve essentially what is a grilled cheese made with jam. Craft’s bar menu also includes piadanas, which is similar to a warm flatbread sandwich. The first time I went to Craft, Alyson Davis (co-owner with husband Dan), highly recommended her namesake piadana, The Alyson, made with sopresatta, pecorino and strawberry preserves. She acknowledged that it sounded like the ingredients wouldn’t go together but assured us it would be tasty. She was right. Craft supports the Charlotte community. When he created Craft, Dan Davis wanted to create a sense of community with a focus on local producers and farmers. He’s accomplished this through his beer, charcuterie, cheese and sundries offerings. Craft not only emphasizes eating and drinking local, but supports and promotes local businesses, artists and events by sponsoring things like Hex Coffee pop-ups, Pin + Pledge for Covet Atelier and even #instabeerupclt. Craft’s patio is perfect for all seasons. 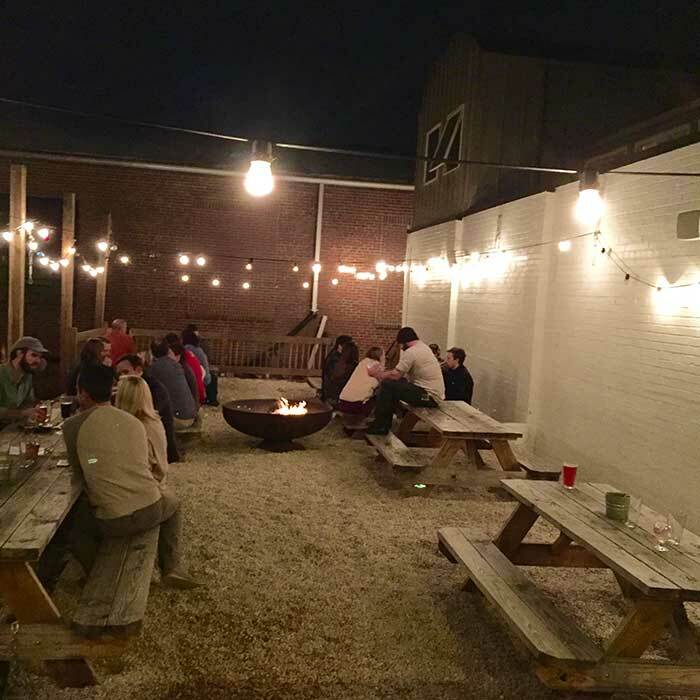 Craft has an excellent patio, adorned with Edison bulbs, picnic tables and fire pit for chilly fall and winter nights. The bartenders come check on you outside regularly, and the speaker system is set up so you can still hear the tunes. On an uncharacteristic 70-degree day last February, we set up camp on Craft’s patio for about five hours. Craft’s owner, Dan, has a ginger beard. Everyone loves a good tinge of ginge, and Dan rocks it.